Located 15km north of Tours, France. It was May 2001 and my wife and I celebrated our 30th year of as they say “wedded bliss” with a 12-day driving trip through the lush spring countryside of northern France. We were rapidly becoming Francophiles due to the enthusiasm of our daughter who was completing her junior year abroad at the Sorbonne and our increasing interest in French history, cuisine, home decorative arts and architecture — in short the culture. It was a wonderful learning vacation with ideal weather that we would soon regard as a naïve period of calm in our lives before the terrorist attacks of the following September. The vacation began with an overnight flight from our home in the Washington, D.C. area to Paris' Charles de Gaulle airport. There we picked up our rental car and I piloted while my wife Willie directed me on the expressways around Paris toward the medieval city of Chartres and the great Gothic “Cathedral in the Wheat Fields.” Neither of us knows French but we soon learned the traffic signs and the rest was similar to driving at home. 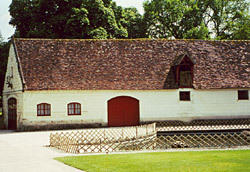 16th century barn at Chenonceax castle on the Cher River, Loire Valley. After Chartres our route took us south to the Loire Valley and the region near Tours where the great 16th century chateaus of such royalty as Catherine de Medici and Francois I are located. Chenonceaux on the River Cher is one of the most notable. From the Loire Valley our route was north and west to Normandy. A somber highlight of the trip was the visit to the American cemetery at Colleville-sur-Mer on the heights above the Normandy beaches where 9,386 soldiers are interred. There was a moving joint U.S.-French ceremony there on the Memorial Day weekend. We also visited several German cemeteries and I was able to interpret a few words for a woman from former East Germany who was making a first visit to her father's grave; she had last seen him when she was four years old. 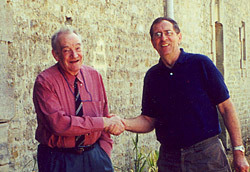 Proprietor of barn near Omaha Beach with the author. 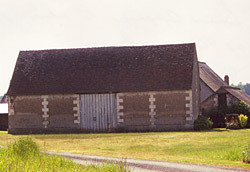 A number of barns were photographed in the immediate area of the June 6, 1944 Allied invasion and subsequent Normandy campaign. 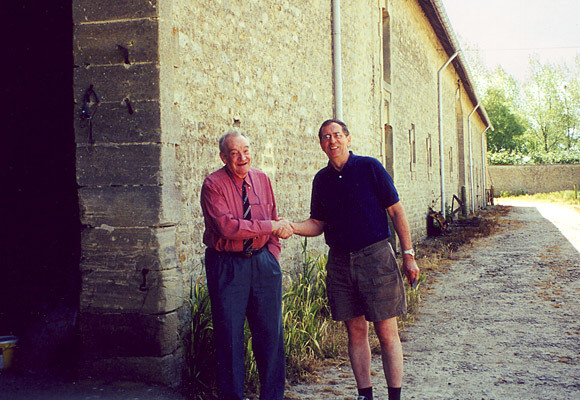 I had the good fortune to find an English speaker at the great stone barn (where I'm photographed with the owner) but subsequent emails in English and French for more details received no response. Our final leg was along the Seine River from its mouth at Le Harve through Rouen where Joan of Arc met her fate and on to Paris. 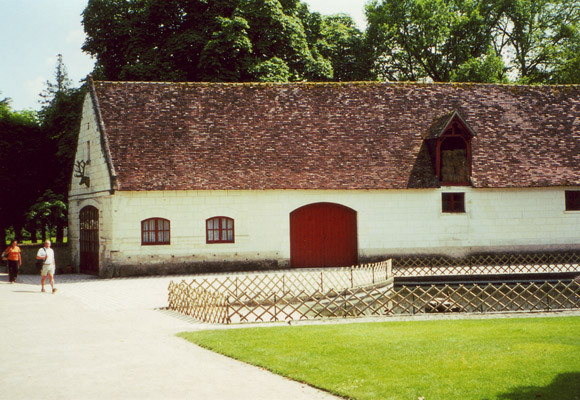 It was in this area that the timbered barn stands next to the country home of Victor Hugo who wrote The Hunchback of Notre Dame and Les Miserables. 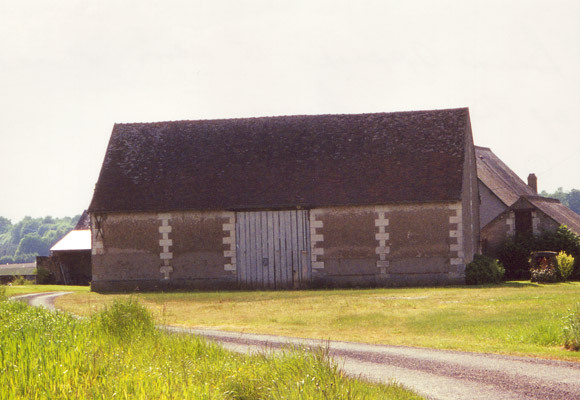 The nearby Benedictine Abbey of St-Wandrille dating from 648 has a 15th century tithe barn that serves as the monastery chapel — an early example of adaptive use! I hope you enjoy this gallery of photos even though due to language difficulties I was unable to learn details of their history and likely future.